For many years I treated bear spray like a first-aid kit – it went in the pack on day hikes and camping trips and I never used it. Over time I learned to actually wear the can of spray so I could grab it quickly, and I practiced with inert spray to get a feel for using it. People who had sprayed bears assured me it works, but I also learned things that changed the way I thought about it. Blowback is one aspect I never considered. As a state wildlife biologist, Dave Battle has pepper-sprayed black bears dozens of times in hazing situations. A few years ago he found himself on the receiving end. 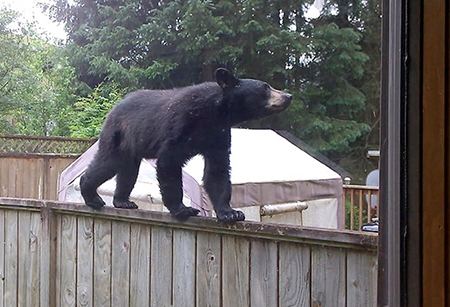 Battle was called to deal with a problem bear, a young black bear, at a home in a wooded Anchorage neighborhood. It’s a situation he’s familiar with and he had a good idea how things would play out. He said it passed quickly and in a few minutes he could see again and breathe normally. That’s a far cry from a direct hit. Jenny Twito, a nurse at Bartlett Regional Hospital in Juneau, said Emergency Department staff treat people who have gotten a face-full of pepper spray. The spray is oily, and cool water is not very effective in removing oil. Dish soap works, but at Bartlett they’ve found it helps to add oil first. Nurse Jenny Twito said she applies vegetable oil or olive oil to the area to bind with the capsaicin oil in the spray, and then uses Dawn dish soap to wash it off. She uses milk to soothe the skin after washing. “For sensitive areas flushing with lukewarm clean water for 15-20 mins is the best practice,” she wrote. Safeguard Self Defense in Rocklin, California, provides a wide range of pepper sprays, and the website for their online outlet, the Pepper Spray Store, offers detailed advice for first aid. Mike Davis granted permission to reprint sections. People react differently, and some respond better to treatment. Regardless, it’s going to burn for a while. If you are sprayed in the face and you wear contacts, take them out as soon as possible. Throw them away, they’re ruined. They recommend first applying whole milk to the affected area. It can be splashed on, a clean towel can be saturated with milk and laid over the affected area, or the affected area can be submerged in milk. It will help take away the burning sensation, but it will not remove the oils in the spray. That is step two. Chad Rice works for Fish and Game and oversees operations at the bear viewing area at Pack Creek. The U.S. Forest Service also shares management of the area. Rice received training in the use of bear spray as part of broader law enforcement training, and said he was in the last class where volunteers could opt to get sprayed as part of the training. He wrote: “I have experienced a full dose. The reason was to show participants that if you remain calm and breathe you can still function so as not to be fully incapacitated. We don’t do this anymore. For me it made the prospect of experiencing blowback or residual spray less worrisome. After the class I knew that it would be uncomfortable but manageable. Pete Schneider is a natural resource specialist with the U.S. Forest Service in Juneau. He trains Forest Service staff in the use of bear spray, and has also had first-hand experience with a face full of bear spray. While it was “horribly unpleasant,” it was a valuable experience, he said. It provided some insight into what could happen in a real self-defense situation. A brown bear on the beach in Glacier Bay. Riley Woodford photo. He said that shampoo and bar soap weren’t really working, so he got out and grabbed liquid dish soap from the kitchen. It worked better, and he actually washed his eyes with it. The effects diminished over about two hours. Most brands of bear spray note that they will spray continuously for seven or eight seconds, (some brands say about five seconds) but short blasts are recommended. The cloud appears to spray out 15 or 20 feet, but that cloud is still pretty potent even when it’s not visible. 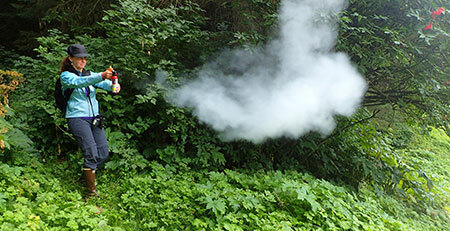 Schneider recommends a blast of two seconds or less, getting a cloud of spray between you and the bear. If you get the bear in the face, don’t keep spraying, just leave. You want to get away from the bear and the spray in the air. (Don’t run – walk away and keep an eye on the bear as you go). He said during training, he’ll demonstrate with cans of expired spray. He’s careful about the wind direction and where students are located, but the spray can carry. Bear spray is defined by air carriers as a hazardous material. It is not allowed on commercial flights, and must be declared on flights in smaller planes headed to backcountry areas. The bear was gone for good. Bear spray is not allowed on commercial flights. If you need bear spray, the TSA suggests you buy it at your destination and leave it behind when your trip is over. But what about that last leg – the flight out to the backcountry in a small plane? You can take bear spray, but you must tell the carrier and the pilot must know. It requires special handling. Carl Ramseth is with Alaska Seaplanes, a Southeast Alaska regional service, which has planes on both floats and wheels. Bear spray is defined as a hazardous material, he said. Some carriers use a length of heavy duty black PVC sewer pipe, four inches in diameter and threaded with caps at both ends. Several cans can be stacked and sealed in the tube for transport. Jason Rupp is a bear viewing guide at Lake Clark. He has never sprayed a charging bear, but he has sprayed brown bears that have persistently and repeatedly investigated the camp. Dave Battle said he has never had a bear not run when sprayed. “They’ve always taken off,” he said. He added that as a state biologist, hazing a bear also involves dealing with whatever is attracting the bear, and that sometimes means a citation to a homeowner. 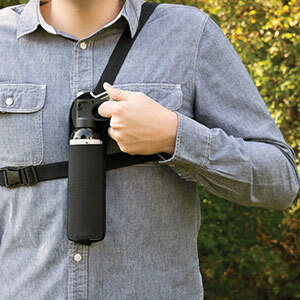 Bear spray in an accessible chest holster. Some prefer a belt holster, but you need to be able to grab it quickly if you need it. Photo courtesy Kristen Romanoff. Battle and Rupp both emphasized the importance of wearing the can of spray on your person. Rupp prefers a holster attached with Velcro to the strap of his daypack, so it’s right on his chest. Chad Rice prefers a belt harness. He said he knows some people who clip the can to the outside of their pack, and he’s seen this lead to accidental discharge. Schneider said if you don’t carry your bear spray where you can get to it immediately, you might as well not bother bringing it. He carries his spray in a big cargo pocket in his pants. Battle said his brief exposure would not discourage him from using bear spray for self-defense. Complete first aid advice from the "Pepper Spray Store" site (scroll down).